An individual first rests his wrist, and on some devices, the middle of his fingers, on the sensor's supports such that the palm is held centimeters above the device's scanner, which flashes a near-infrared ray on the palm. Unlike the skin, through which near-infrared light passes, deoxygenated hemoglobin in the blood flowing through the veins absorbs near-infrared rays, illuminating the hemoglobin, causing it to be visible to the scanner. Arteries and capillaries, whose blood contains oxygenated hemoglobin, which does not absorb near-infrared light, are invisible to the sensor. The still image captured by the camera, which photographs in the near-infrared range, appears as a black network, reflecting the palm's vein pattern against the lighter background of the palm. 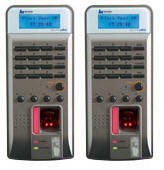 The new technology has many potential applications (some of which are already in use) such as an ultra secure system for ATMs and banking transactions, a PC, handheld, or server login system, an authorization system for front doors, schools, hospital wards, storage areas, and high security areas in airports, and even facilitating library lending, doing away with the age-old library card system. 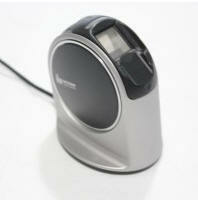 Fujitsu is planning to continue the development of the palm vein technology, shrinking the scanner to fit a mobile phone. Fujitsu hopes that its success might usher in a new age in personal data protection techniques, which is especially important when sales of Smartphones and other handhelds are skyrocketing. Mr. H. Watanuki of Fujitsu's Biometric Business Development Department about the application of their palm vein technology. Q: Is there currently a retail product on the market that uses your technology? A: Yes. 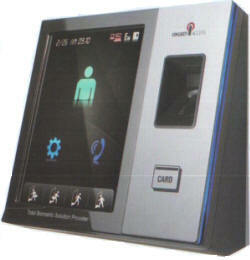 Some Japanese banks have adopted our palm vein authentication technology on their ATMs (e.g., Bank of Tokyo-Mitsubishi). Q: When do you expect that commercial end-user products (such as personal computer biometric systems and door-lock mechanisms) based on your technology will be available on the global market? A: Fujitsu has globally released an SDK (software development kit or "devkit") for palm vein technology since April, 2006. We do hope that some vendors will soon develop related products using our SDK, including the ones you have described. 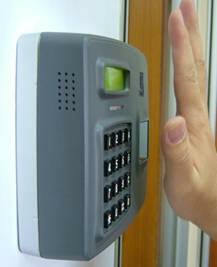 Biometrics offers superior security than PIN or ID Card. Biometric methods do not involve danger of information exposure like PIN and ID Card do and unauthorized persons cannot attempt to steal or make a guess at private information. Today, people have to remember many passwords. They should be able to provide their passwords whenever they use their credit cards or log into various sites on the Internet. Uniform passwords can lead to serious dangers if exposed. However, biometrics does not require us to remember our passwords. An individual's vein pattern image is captured by radiating his/her hand with near-infrared rays. The reflection method illuminates the palm using an infrared ray and captures the light given off by the region after diffusion through the palm. The deoxidized hemoglobin in the in the vein vessels absorbs the infrared ray, thereby reducing the reflection rate and causing the veins to appear as a black pattern. This vein pattern is then verified against a preregistered pattern to authenticate the individual. The pattern of blood veins is unique to every individual, even among identical twins. Palms have a broad and complicated vascular pattern and thus contain a wealth of differentiating features for personal identification. Furthermore, it will not vary during the person's lifetime. It is a very secure method of authentication because this blood vein pattern lies under the skin. This makes it almost impossible for others to read or copy. As veins are internal in the body and have a wealth of differentiating features, attempts to forge an identity are extremely difficult, thereby enabling a high level of security. In addition, the sensor of the palm vein device can only recognize the pattern if the deoxidized hemoglobin is actively flowing within the individual's veins. This system is not dangerous, a near infrared is a component of sunlight: there is no more exposure when scanning the hand than by walking outside in the sun. 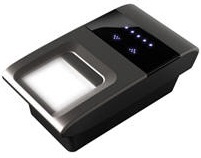 Among all available biometric technologies, fingerprint identification is the most popular one. This is due to the fact that fingerprint identification is far more efficient than others, especially considering how economical it is. This standard was developed by I/O Software in 1998. 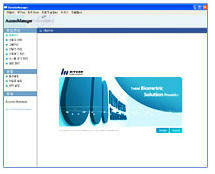 Being O/S, computer platform, and sensor device independent, it was designed to support the development of applications. Some of the features include the unification of encryption method, standardized programming environment, and support for the client-server applications. This method was first introduced in December 1997 at the 10th U.S. Biometric Consortium held by National Registry Inc. a company sponsored by the U.S. Ministry of National Defense. Thinking that biometrics would be useful in computer security, the U.S. Ministry of National Defense supported the development. However, they failed to secure companies to work on the project. Compaq was the first company to form BioAPI Consortium, which consisted of 6 companies with a goal to standardize industrial biometric identification API in April 1998. In December of the same year, and in March the following year, BAPI and HA-API were included in new BioAPI. BioAPI Consortium was constituted by various groups, including 78 companies who are biometric identification developers and medical/financial/ governmental users. 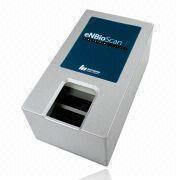 BioAPI has recently been adopted as ANSI/INCITS 358, American standard. Biometrics Information Fingerprint Information Time Attendance Information Biometric security services Information Biometric technology Biometric companies Information Biometric research Information Biometric books biometric tutorials biometric biometric access biometric contact pune services Precise Time attendance Access control OEM modules Information Authentication Identification Verification Information Proximity Information RFID Information smart cards Information Software Hardware free low cost cheapest products Solutions project services development matching recognition.